Real Madrid have won 3-1 at Cadiz this Wednesday night, but the big news are that the Merengues got into serious trouble after fielding an ineligible player into the game. Cheryshev was carrying on a suspension from last season, but was on Madrid's starting eleven even scored the opener tonight. Sticking to what happened on the field, Benítez was forced to make plenty of changes to his side. With Sergio Ramos, Varane, Carvajal and Marcelo all injured, the Spaniard had to turn his choices into the likes of Arbeloa, Nacho, Pepe and Llorente. In goal, Kiko Casilla replaced Nacho. Madrid's midfield had a trio formed by Casemiro, James Rodríguez and Isco, as Benítez decided to rest both Luka Modric and Toni Kroos. Curiously, neither Kovacic nor Odegaard had a chance to start. The Croatian would come in later in the second half, but the Norwegian didn't even sit on the bench. Up top, the BBC was also rested and it was time for Lucas Vázquez, Cheryshev and Jesé Rodríguez to fill in for them. The Russian shouldn't have been on the field though, since he had already seen 3 yellow cards in the competition with Villarreal last season and had to go through a 1-game suspension this season. 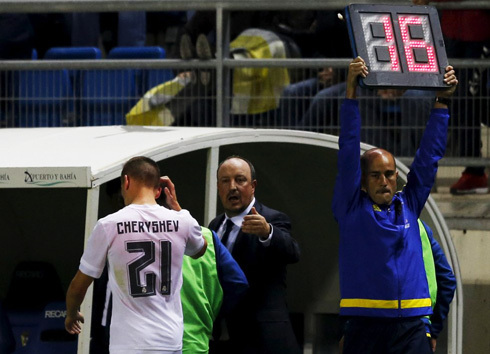 No one in Madrid noticed that irregularity until the game reached the halftime, so when Benítez decided to sub Cheryshev off for Kovacic, it was already too late... It appears the error won't be forgiven by Cadiz and Real Madrid will see their way out of the competition because of an amateur mistake. Real Madrid would add a second and third goal to their night after the break, as Isco stepped up thanks to assists from both Casemiro and James Rodríguez. The Spaniard made Cadiz pay in two counter-attacks and showed how much of a menace he is when he is given enough freedom and space behind enemy lines. Cadiz would still cut down distances near the end, after making the most out of a poor clearance from Pepe inside Real Madrid's box. The goal wouldn't change anything though and a few moments after the game was over, Cadíz's president, Manolo Vizcaíno, spoke to the press to announce that the club had already decided to go forward with the official complaint about Real Madrid's having fielded an ineligible player against them. The rules in Spain and in the Copa del Rey in particular are very clear about that and they say that the infractor, Real Madrid in this case, is immediately kicked out of the competition. Attackers: Lucas Vazquez, Cheryshev, Jesé. Cristiano Ronaldo next game will be for Real Madrid on the 5th of December of 2015, against Getafe. You can watch Juventus live stream, Real Madrid vs Getafe, Valencia vs Barcelona, Manchester United vs West Ham, Reading vs QPR, and Schalke vs Hannover, all matches provided from our live football game pages.